Well here it is - Episode 1 of the MicroWarpCast podcast. While waiting for the show to officially go up over at VirginWorlds, I've been playing around with my Box.net account, trying to add this first episode to my blog. MicroWarpCast is an EVE Online podcast hosted by David "CrazyKinux" Perry and Tom "YoMma" Yeates. Each week we bring you the latest EVE news, blogs, articles and general information to help you keep up to date with the latest in game and community events. 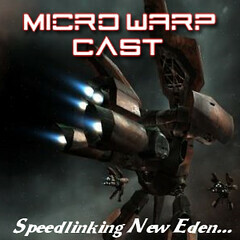 'MicroWarpCast - Speedlinking New Eden' is part of the Virgin Worlds MMO Podcast Collective. 3) What are we doing in EVE and what other games are we playing? Brent from VirginWorlds, who’s been an inspiration and the spiritual father of this podcast. Please support our efforts here at VigirnWorlds.com. AlienHand for providing us with a track for this show. And SeriousSally for the great logo! Fly Safe and see you next week! Wait, I just got to the part of, well... Me! No wonder my stat has been climbing! Oh MOST EXCELLENT first episode. Can't wait for more--and thank you so much for the kind words during your discussion about my speedlinked exploration post. Bravo, CK & YoMma! Great podcast guys, looking forward to the next one. Cool. Thanks for the mention guys! Thanks for the feed back all! It was a lot of fun to do and to edit. The bumper track music is from XQ28 and the song is called Zen. As for pimping your articles, if you guys didn't write great stuff, I couldn't do these EVE Speedlinking post, nor the Micro Warp Cast podcast. Great podcast bro, was absolutely phenomenal! @Manasi - Thanks mate! Looking forward to recording numero dos!